Over the last five weeks, Johnnie has made it very clear to me that dogs will be dogs. Dogs have natural behaviors that, for their well-being, they need to express, including digging, chewing, chasing, seeking, etc. These behaviors can be found in different dogs at varying levels – even within individual breeds and closed gene pools – but most dogs have a need for a combination of these and other behaviors to be met in their daily life. Like I wrote about on Tuesday, a fabulous Your Dog’s Friend “Creative Behavior Outlets” seminar reminded me that I need to help Johnnie Cash find productive ways to express her natural behaviors. Lots of dogs need “jobs,” and when they lack a job, they get themselves into trouble. This is where mental puzzles come into play to help fatigue her brain. I also want to go a step further than that and give her outlets for a few other behaviors, including chewing in particular. When people tell me that their dog chewed up their favorite pair of sunglasses or a couple pairs of shoes, I wonder two things: 1. why did your dog have access to those in the first place and 2. did you give him alternative appealing things to chew? Unfortunately you can’t just wish away your dog’s want and need for chewing because of all the reasons I mentioned above. Johnnie’s environment at our home is structured in such a way that, when she’s not directly supervised, she doesn’t have much ability to get into things. She has still managed to find a plastic cap here or there, which shows me that I need to give her more options for chewing that are appropriate and appealing to her. Thanks to the advice on some friends, I found a few great options to satisfy Johnnie’s need for chewing. We have the trusty antler that lasts her many months and will occupy her for 15 – 30 minutes at a time, but only when the mood strikes her. We have the plain sterilized bone that is slightly less appealing to Johnnie than the antler, though does strike her fancy every once in a while. These are the two things we leave out for her at all times. For those times when we want her extremely occupied for a solid 45 – 60 minutes, we pull out the extra-thick bully sticks or marrow bones. My favorite place to get these (when I think ahead, at least) is www.bestbullysticks.com. Your local pet store should have these or similar items as well, but make sure you’re getting brands that aren’t made in China and that you’re steering clear of rawhide, which is more difficult for your dog to digest. I would consult with your vet about how often your dog can handle bully sticks or bones, because they do carry lots of protein and calories that you don’t want to necessarily overfeed. Like the food puzzles, the extra chewing devices have really done some good for Johnnie. Not only do they give her a great outlet for a behavior she clearly needs to express daily, they wear her out in the mean time. Working on a bone for 45 minutes nearly knocked her right off her feet the other day – it was great! If you do find that your dog is exhibiting particularly destructive behaviors, one issue you might be having is lack of exercise. It all goes back to the same concept: dogs have an allotted amount of energy to expend per day – and if you don’t expend it for them, they’ll find ways to do it themselves. You should find a combination of physical and mental exercise to keep your dog from deciding the legs on your table are his new favorite chew toy! 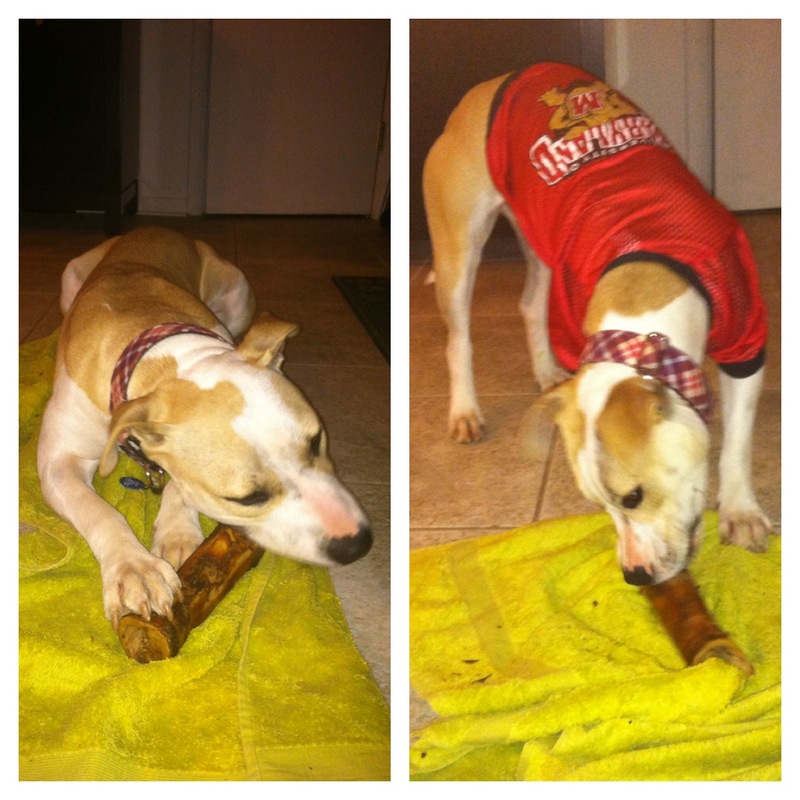 To adopt Johnnie Cash and give her plenty of productive chewing options, email peacelovefoster@gmail.com. This entry was posted in Dog talk, Johnnie Cash, Uncategorized and tagged adopt me, bully sticks, dog behavior, dog bones, dog training, dogs chewing, foster dog, how to stop your dog from chewing, natural dog behaviors, puppy behavior. Bookmark the permalink. We looove antlers in this house! Our favorite type is moose! THe pooches love bully sticks, too, but they don’t last nearly as long as the anters do and are expensive. I will have to check out the website – thanks for the tip!! Great tips on letting a dog be themselves. :) wish I had known this when I had dogs but I will pass it on to other dog owners. 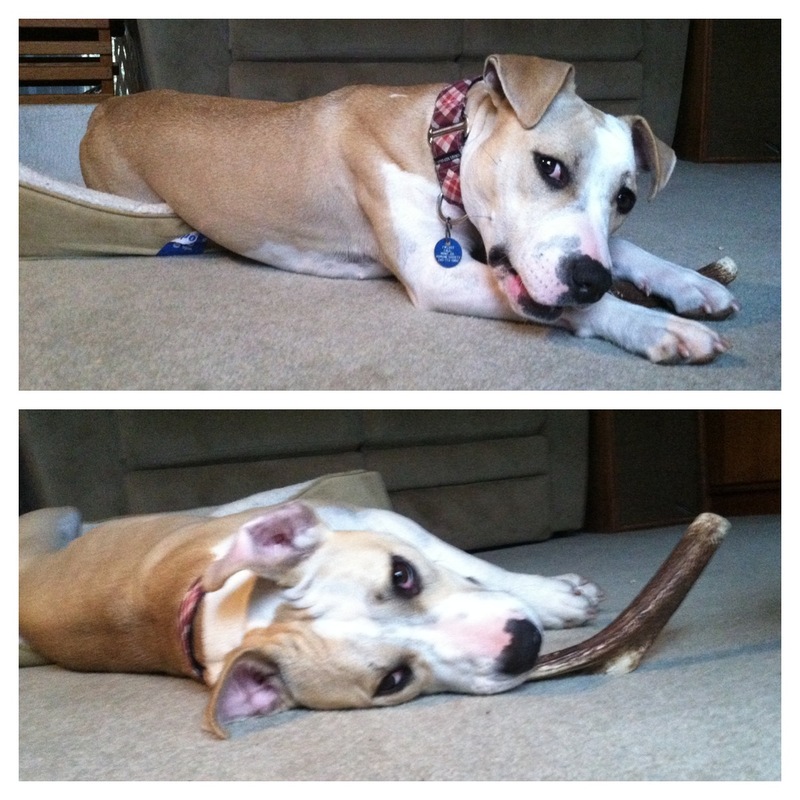 Marrow bones, bully sticks and antlers are Eko’s favorites. Like you, I recommend them to anyone who has a power chewer that needs to chomp out some energy. If you have a strong chewer and are willing to invest in antlers moose it definitely the way to go. In terms of strength deer is the least, followed by elk, then moose.